Celebrate spring with a collection of scrapbooking supplies that will take your breath away. 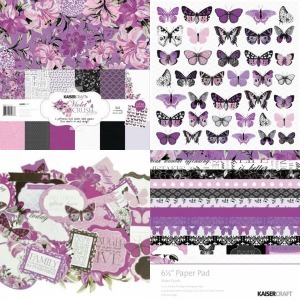 The Violet Crush Collection from Kaisercraft is a beautiful assortment of pages, paper punches, stickers, stamps, and embellishments. Perfect for a spring or summer-themed scrapbook, this collection of paper products features flowers, butterflies, and intricate scrollwork. The pink and purple color palette is as feminine as it gets without veering into kitsch. There are 7 double-sided scrapbook pages in the Violet Crush Collection, and the designs are so stunning that you'll want to use both sides of each one. There's a special die cut page with floral accents and delicate trim that makes a great addition to any layout that needs something a little extra. This kit also includes a 6.5" paper pad that contains specialty pages such as foil paper and die cut pages. But this collection is much more than pretty paper. Scrapbookers, like all creative people, love to have flexibility in their crafting. The Violet Crush Collection gives you multiple options for decorating your pages, such as embellishments, stamps, and paper punches. In addition to the requisite flower and butterfly accents, this kit comes with blank punches that you can make into cute journal cards. If you run out of die cut elements, you can always create your own using this pad's generous supply of illustrated paper. Some of the embellishments have inspirational quotes printed on them. A personal favorite reads, "Sometimes you will never know the true value of a moment until it becomes a memory." The stamps that come with this collection are equally uplifting, as is the case with the quote, "Laugh as much as you breathe and love as much as you live." These are wonderful sentiments for a scrapbooker to keep in mind as she assembles her memory book.